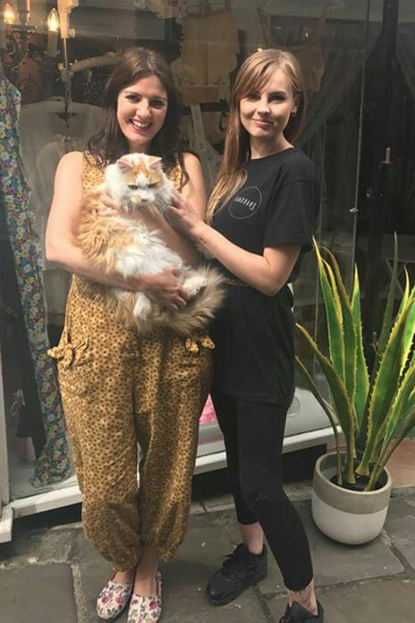 When hairdresser Lucy Preston started chatting to the owner of the shop next door in Frome, Somerset, she didn’t realise that they had something very unusual in common. Lucy had been talking to Truly Sopel, the owner of the fashion shop of the same name, on her lunch breaks from Ramshack Barbers, but it wasn’t until she looked at Truly’s Instagram account that she noticed someone familiar – a handsome ginger-and-white cat called Bono. 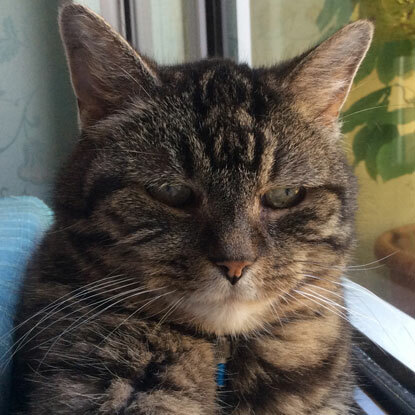 Truly had posted lots of photos of her 15-year-old moggy, and Lucy recognised him as the same cat that used to belong to her partner Ryan Greenwood and mother-in-law Nicola Greenwood. 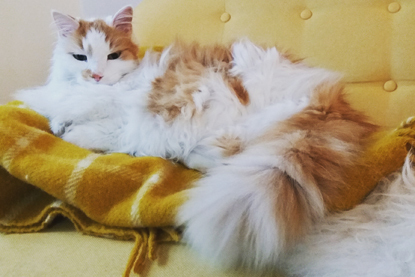 Nicola had cared for Bono since he was a kitten but nine years later had to give him up to Cats Protection’s Midsomer Norton & Radstock Branch because a change in her living circumstances meant she could no longer look after him. Losing your beloved cat can be just as devastating as the loss of any other friend or family member. Your feline friend is a constant source of comfort, joy and unconditional love, someone that gets you out of bed in the morning, welcomes you home after a hard day and is always there to listen to your worries and problems. Not having that faithful companion around anymore, whether that’s because they have gone missing, passed away or you have had to make the difficult decision to give them up or have them put to sleep, can leave a big hole in your home and your heart. Sadly, the loss of a pet isn’t always seen in society as a significant loss and others can struggle to show understanding and compassion for those grieving for an animal. This can sometimes make you feel like you are unable to express your sadness and cause you to feel alone, but it’s important to allow yourself to grieve. Grief is a very personal process and everyone experiences it differently. You may feel sadness, anger, anxiety, guilt, denial, shame, despair, confusion, tiredness or even experience physical sickness and pain, but all of these are completely natural. You might find that your grief subsides after a few weeks or months, or it could last for a year or more, but the intense feelings will eventually pass. Be patient and allow yourself to feel the sadness and pain. Only you will know when you’re ready to move on. It can be difficult to stay healthy and active when you’re grieving, but looking after yourself will help you to cope. Try to keep up your daily routine, eat healthily, and get plenty of sleep. Also avoid things that could ‘numb’ the pain, such as alcohol, as this will only make you feel worse when the numbness wears off. 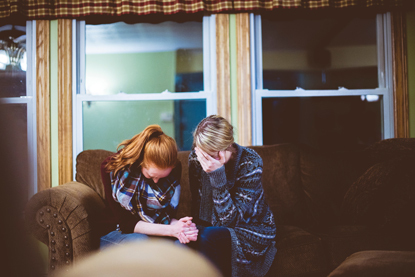 Sharing how you feel with someone who understands how important your cat was to you can help you process your grief and cope with painful emotions. 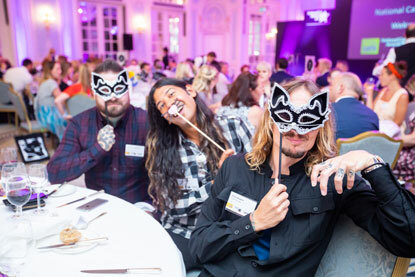 You could talk to a friend, family member or one of Cats Protection’s trained volunteer listeners who can provide emotional and practical support during this very difficult time. Our free and confidential Paws to Listen helpline is available Monday to Friday, 9am-5pm on 0800 024 94 94. If your grief becomes complex or prolonged, you might find that speaking to a counsellor will help. Talk to your GP about finding a suitable counsellor for you. You can find more advice and support in coping with the loss of your cat on the Cats Protection website where you can also pay a special tribute to your beloved feline friend on our Memory Wall. For advice on how to support a friend or family member who is grieving for a cat, take a look at our tips here. When a friend or family member is heartbroken from the loss of their beloved cat it can be difficult to know how to help them through it. For most cat owners, their moggy is a best friend and part of the family, so when they’re gone it can leave a massive hole in their life. 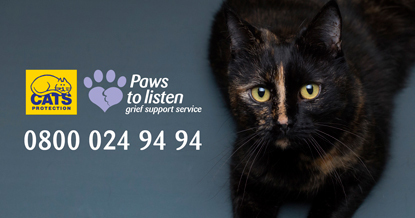 Whether their cat is missing, has passed away or they have had to give them up, it’s completely normal for them to grieve but it can be difficult for others to understand their feelings. Sadly, the loss of a pet isn’t always seen in society as a significant loss and this can make people feel like they can’t express their emotions and cause them to feel alone. Grieving is a very personal process and everyone experiences it differently. They may feel sad or angry, blame themselves or others or even express guilt for the way they feel. They could also become more dependent on others, or withdraw and feel unable to relate. Whatever they are feeling, let them know that it is completely natural and give them the time and space to process their emotions. The best way to provide support to someone who is grieving is to encourage them to talk to you and actively listen to what they have to say. Showing you understand will help them feel less isolated and let them know it’s ok to feel whatever they’re feeling. 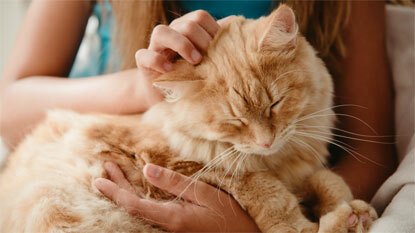 You could also recommend that they give Cats Protection’s Paws to Listen helpline a call. 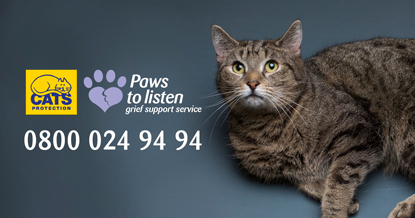 We have a team of trained volunteer listeners who can provide emotional and practical support for grieving cat owners. They are available Monday to Friday, 9am-5pm on 0800 024 94 94. Try to see the situation from their perspective to understand what they might be feeling. This can be difficult, particularly if you have never experienced the loss of a pet yourself, but having empathy will help you to be more compassionate and encourage them to share their feelings. When a loved one is in pain, it’s only natural to want to fix it but this isn’t always the best thing for them. They need to be able to fully experience their emotions so that they can move through them and deal with their grief. Avoid trying to suggest things that might ‘cheer them up’ or saying that they could get another cat. You might mean well, but it won’t be very helpful for them in that moment. Often just being there for them is enough, you don’t need to say a word. Try not to seem shocked or surprised by what they say or the feelings they show, and avoid implying what they should or should not be feeling. Everyone handles grief differently and they need to know that whatever they are feeling is normal and healthy. It might feel natural to say statements such as “I’m sure you’ll feel better soon” or “You’ll be ok” but even though you mean well, they’re not very helpful to hear. Just listen, acknowledge their feelings and be there to hand them a tissue or give them a hug if they need it. 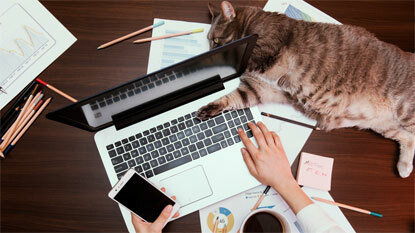 For more advice and support for coping with the loss of a cat, visit the Cats Protection website. If you are struggling with the loss of a cat, take a look at our tips for coping with your grief. 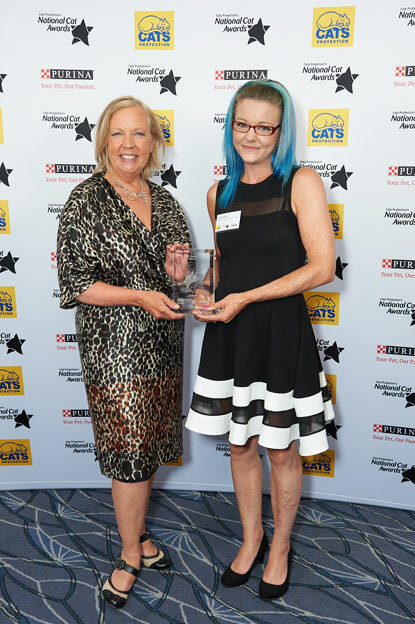 At Cats Protection we welcome volunteers of all ages and backgrounds, and we have a variety of roles on offer. 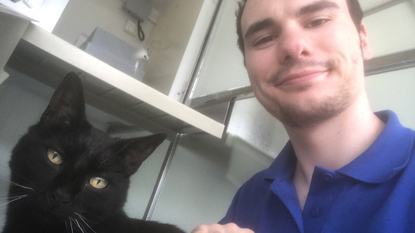 For young people, joinging our team of over 10,000 cat-loving volunteers is an excellent way to learn new skills, gain experience for your future career and even look after your mental health and wellbeing. 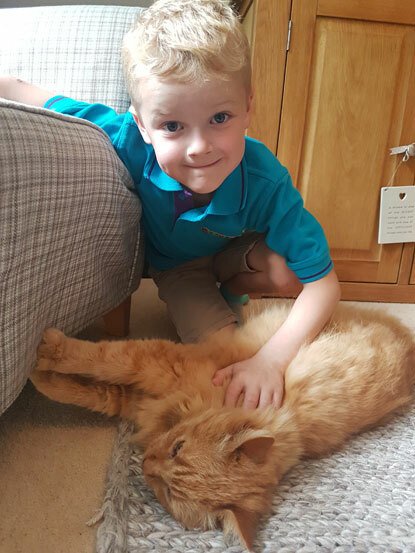 One of our valued volunteers, Henry, is just one of the young people devoting their time to Cats Protection. As a Cat Care Volunteer at the Cornwall Adoption Centre while studying at the University of Exeter, he explains why spending time with the cats is just one of the many reasons to volunteer. What made you decide to volunteer with Cats Protection? I found starting university very stressful and needed an escape, something I could do to help relax and unwind and something that was rewarding too. I saw a video on Facebook of one of my flatmates petting a beautiful black cat – she had just begun volunteering with Cats Protection as the Cornwall Adoption Centre is only 15 minutes away from campus. I immediately applied to be a Cat Care Volunteer. Helping with the morning cleaning at the centre, as well as spending the afternoon socialising with the cats helped to relieve a lot of stress. There was a positive shift in my overall mood and alertness as a result. 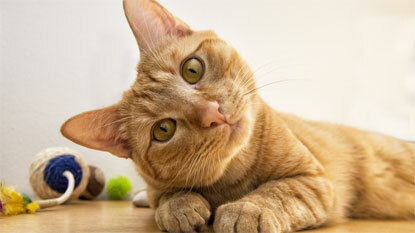 What does being a Cat Care Volunteer involve? The main part of my role is the morning cleaning duties at the centre. Working with the Cat Care Assistants and other volunteers, I make sure the centre is clean to limit spread of diseases and provide a comfortable environment for the cats in our care. A usual day begins at 8am, where I’ll check the rota to see where I’ll be working and who I’ll be working with. Then the three main duties: feeding the cats, cleaning the front of the pens and cleaning the back of the pens, are shared among the team. Closely monitoring the behaviour, food intake, water intake and toileting habits of the cats is just as important, to ensure they are as healthy and happy as possible. What course did you apply for at university? How do you think your volunteering skills helped with this? I applied for History and Politics at the University of Exeter. I only discovered the true extent of my passion for animal care and animal welfare after starting university, which is why I am not studying a course more related to my volunteering role. Without university I would not have found my volunteering role, and would not have discovered just how rewarding I find being part of volunteering projects. Not only does volunteering help benefit and strengthen your university application, but university also provides a huge array of new, exciting, and exclusive volunteering opportunities. How do you balance volunteering with your university course? Balancing life at university is always tough at first; it just takes a little bit of time and practice. I found the easiest way for me to balance the two was to devote one day a week to my volunteering role, and the other six to my course. I found this to be a fair and enjoyable balance, although I did occasionally devote a little more time to my volunteering role when my university workload was lighter than usual, or if I was becoming too stressed and needed more time to unwind. I would encourage anyone who is trying to balance volunteering and a university course to experiment with different ratios of the two, and just see what feels the most comfortable. For me, university is not just about studying; it is about making the most of the opportunities that I’m given and pursuing whatever I am passionate about. 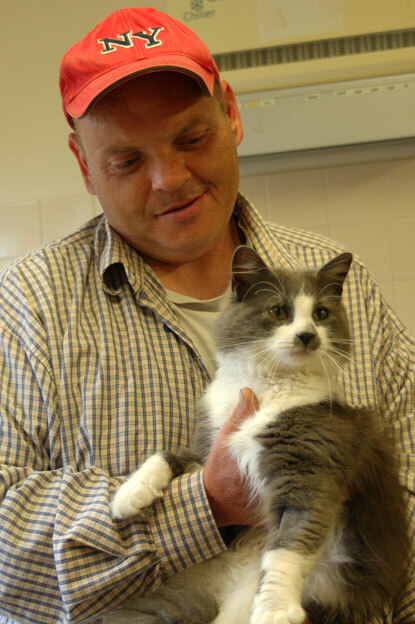 What is your favourite part about volunteering with Cats Protection? It is almost too difficult to choose! I do enjoy the cleaning, because I like the structure and routine of it each week. And I definitely love socialising with all of the lovely cats and kittens that spend time in our care. But I would have to say that my favourite part of volunteering is the atmosphere; everyone, staff and volunteers alike, is so lovely and kind. Everyone shares the same passion and empathy for cats, and many other animals too. 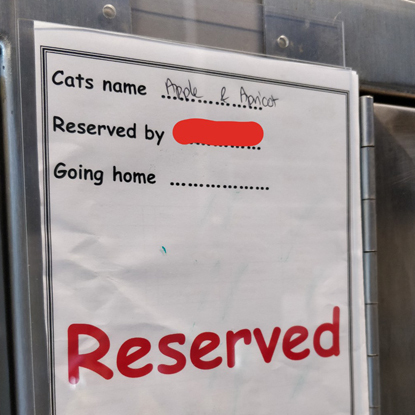 I quite often find myself bonding with my colleagues over the love of certain cats in the centre, and there are always plenty of interesting and funny stories about what the cats have been getting up to! What are you looking to do after university? Do you have a specific career in mind? Before I came to university I didn’t know what I wanted to do once I had graduated. I briefly considered further study but didn’t feel that it was right for me. Since volunteering with Cats Protection, I have become very interested in animal care and the charity and volunteering sector. 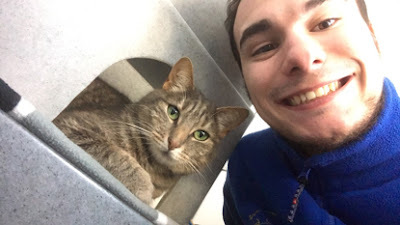 I want to find something that I find as enjoyable and rewarding as the role I currently do and I think that being a Cat Care Assistant could be just that. But I know that I may not be fully qualified for a role that is very hands-on in animal care, so a role in the behind-the-scenes of the charity might be a more realistic career ambition. 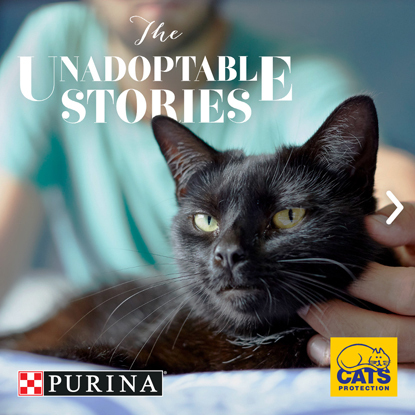 PURINA® and Cats Protection have teamed up to help find every cat their perfect match. 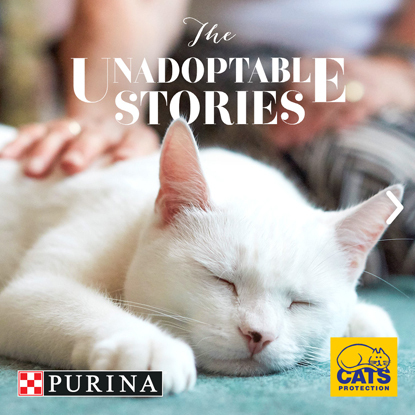 We believe that no cat is unadoptable and to prove it we’ve found some heart-warming stories that show there is the perfect owner out there for every cat. Read about Elaine and her moggy Sam, Samantha and her cat Belle and Sam and his kitty Coco below. 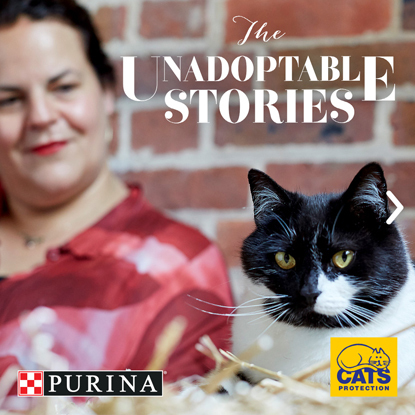 Purina has been the charity’s partner for over 35 years and through The Unadoptables Stories campaign hopes to spread awareness of our work and encourage people to adopt. Lookout for more stories on our Facebook and Twitter pages over the next few weeks, and on 7 September pop into selected Sainsbury’s stores to learn more about the cats in our care and pick up a money-off coupon! When Elaine found out that moggy Sam had hearing problems, she wasn’t put off. “‘So what?’ I said. I’m profoundly deaf, I wear two hearing aids, it’s just one of those things,” explained Elaine. “Anyway, if people annoy me I can always turn them off. “I’d lost my last cat and my husband within a very short time of each other and it hit me very hard. When I met Sam he was so affectionate, I’d like to think he knew I needed a friend. He made himself at home right away. I wouldn’t say he’s spoilt but he will have the armchair and I get the foot stool. He doesn’t take up much room, that’s because he’s always lying on top of me. And he keeps me on my toes. I wish I could keep up but he’s got four paws and I’ve only got two legs. “I’m allergic to cats, so I’m not exactly what you’d describe as a typical cat person,” said Samantha. “I’ve always wanted my son Henry to feel the happiness that cats can bring but I couldn’t have a cat living in the house. 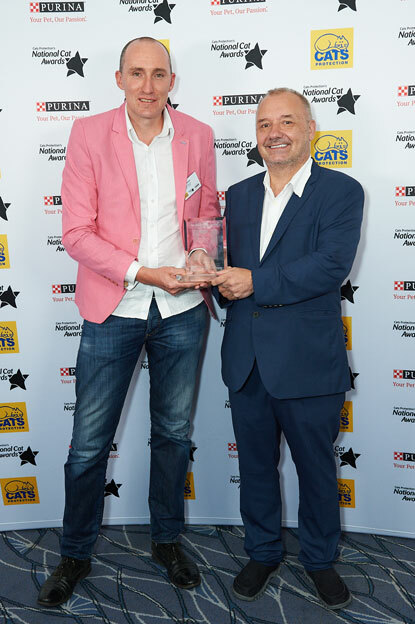 When I chatted to Cats Protection about adoption, rather than look at me as if I was bonkers, they saw me as the possible answer to one of their cat’s very unique needs. That cat was Belle. 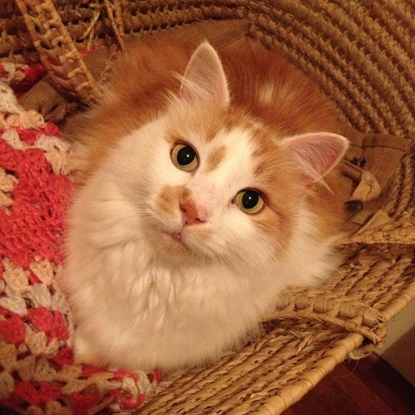 “We first saw Coco when we looked into adopting a cat for our little girls,” said Sam. “Being young, they had their hearts set on a kitten, while Lara, my wife, had always wanted a black cat. This came from her childhood love of witches. Her favourite TV show growing up was Sabrina the Teenage Witch, and the witch had a talking black cat as a pet. “We could not believe it when Cats Protection told us that many of the cats in their care are actually black, because many people simply don’t want them. She made up her mind right there that Coco was going to be ours. She even thought about renaming her Salem, after the cat from the TV show! But thankfully, we persuaded her to keep the name Coco. The girls weren’t at all sad that she’s not a kitten, they absolutely love her. Cats Protection has thousands of cats waiting for their forever homes, but sadly some stay with us longer than others. It could be because they’re older, a little shy or have special medical needs, while for some it’s simply down to their colour. Unfortunately black cats take 13% longer to rehome than their more colourful counterparts, but beauty is much more than fur deep. Through no fault of their own, these moggies get overlooked time and time again when all they want is a cosy home to call their own. Ten-year-old Smudge was found as a stray and has been at our National Cat Adoption Centre in Sussex for more than five months. This handsome boy is inquisitive, playful and loves attention. He would make a wonderful pet and, with the right introduction, could live happily with children. 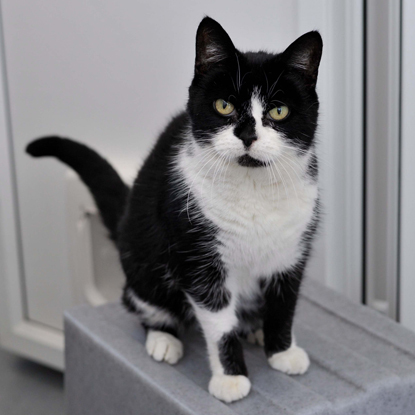 If you can offer Smudge a home, email cattery.reception@cats.org.uk or call 01825 441 330. 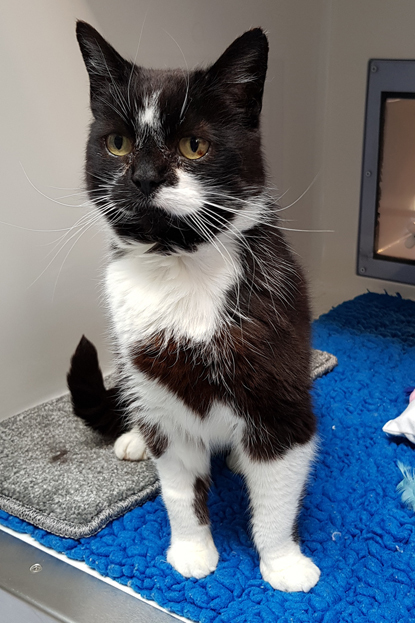 Tink is a mature moggy at 15 years old and arrived at our National Cat Adoption Centre in Sussex when his owner moved house and could not take him with them. 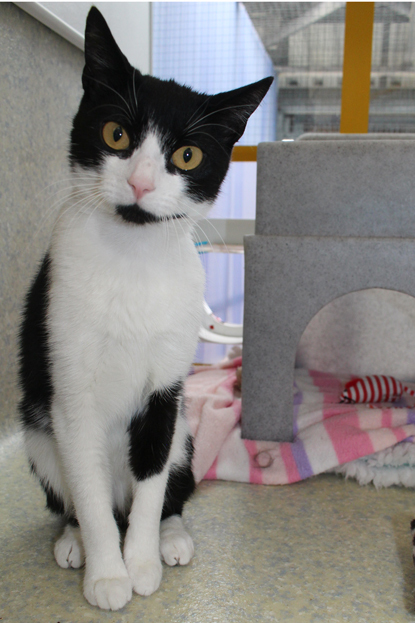 He has been at the centre for over three months but is very friendly and would love a garden to explore. 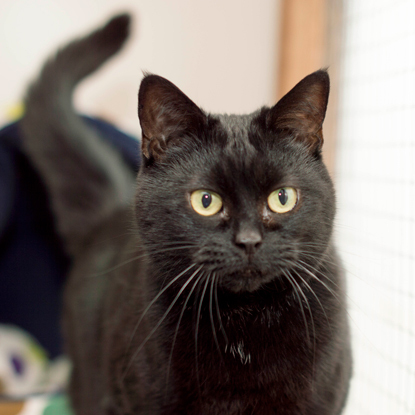 If you can offer Tink a home, email cattery.reception@cats.org.uk or call 01825 441 330. 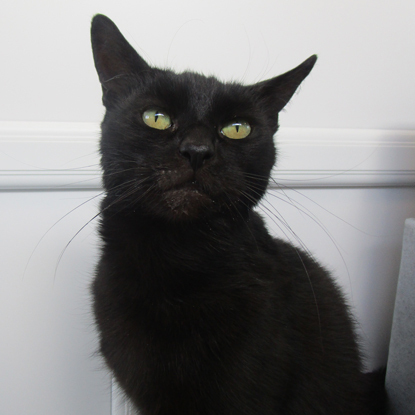 Nine-year-old Lovey has sadly come into the care of our Bridgend Adoption Centre for the second time, as the person who previously adopted her had to return her. 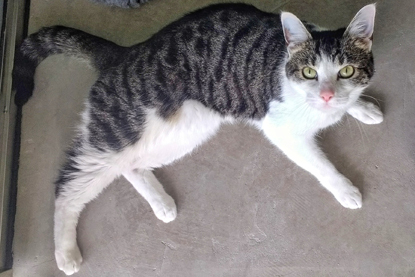 She's an affectionate cat, but on her own terms, and would suit a home where she can be an only pet and there are no young children. If you can offer Lovey a home, email bridgend@cats.org.uk or call 01656 724 396. Pretty Pippy is 11 years old and has epilepsy, so needs an understanding owner who can give her medication every day to help control her condition. She came into our Bridgend Adoption Centre almost two months ago when her previous owner had to go into care. If you can offer Pippy a home, email bridgend@cats.org.uk or call 01656 724 396. Muggins is a four-year-old ball of energy and hasn't coped well with life in a pen. He has been at our York Adoption Centre for over four months and desperately needs a home where he can run around and enjoy himself. He can be a bit of a handful so needs experienced new owners who know how to deal with excitable moggies. 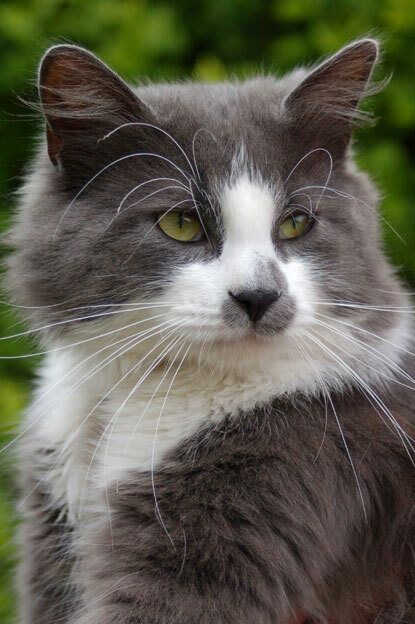 If you can offer Muggins a home, email york@cats.org.uk or call 01904 760 356. Two-year-old Rose is lively and quirky and needs a loving home where she can burn off some energy. She's affectionate on her own terms and extremely playful but will let you know when she's had enough. 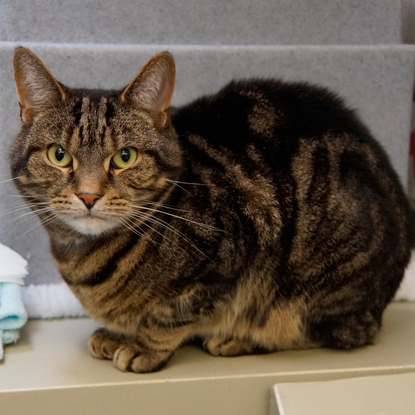 She’s been at our Exeter Adoption Centre for around five months and didn’t get on with the young children in her previous home so needs somewhere with older teenage children or none at all. 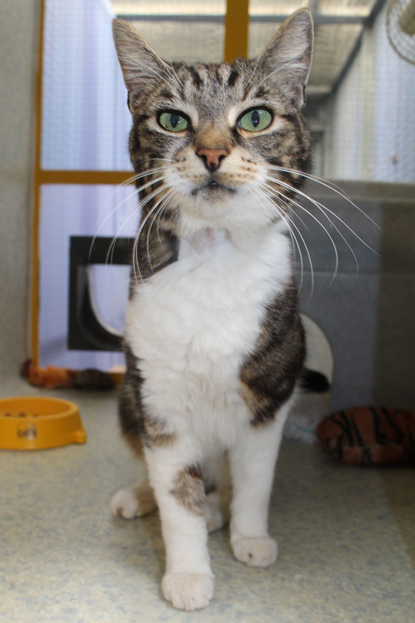 If you can offer Rose a home, email exeteraxhayes@cats.org.uk or call 01395 232 377. 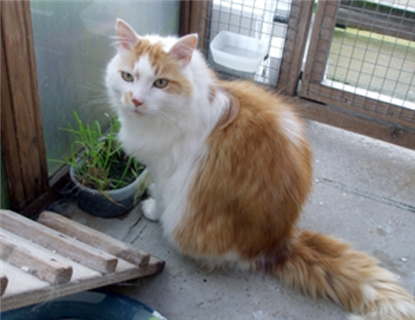 Golden oldie Lollie has FIV (the feline equivalent of HIV) and so needs an indoor-only home where he is the only pet. 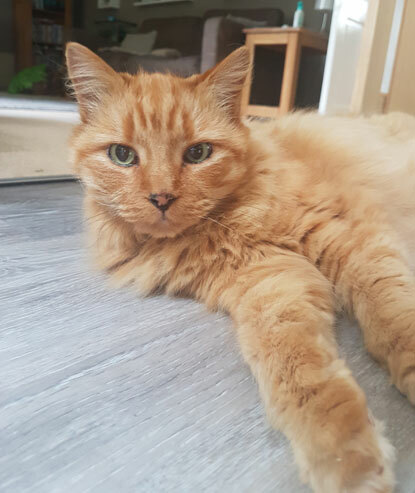 He’s 13 years old and came to our Exeter Adoption Centre after getting stressed in his previous home, where there were lots of children and dogs. He has been in our care for nearly three months and just needs a nice relaxing place to stretch out and snooze in peace. 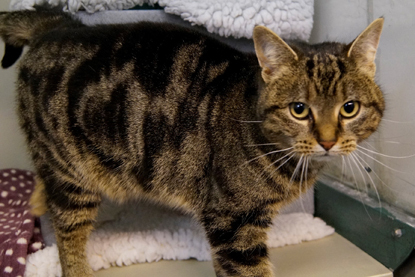 If you can offer Lollie a home, email exeteraxhayes@cats.org.uk or call 01395 232 377. This mother and daughter duo are in need of a new home together as a result of the death of their owner. Currently being cared for by our Tunbridge Wells, Crowborough & District Branch, they have been searching for a new home for four months. They lived alongside another cat for a while and found the experience stressful so they will need to be the only cats in their new house, although they could live with calm dogs. 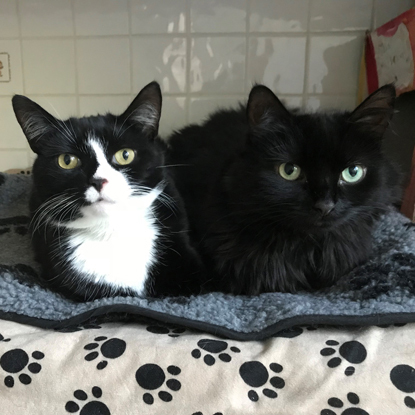 If you can offer Cagney and Lacey a home, call 01892 516 377 or get in touch here. 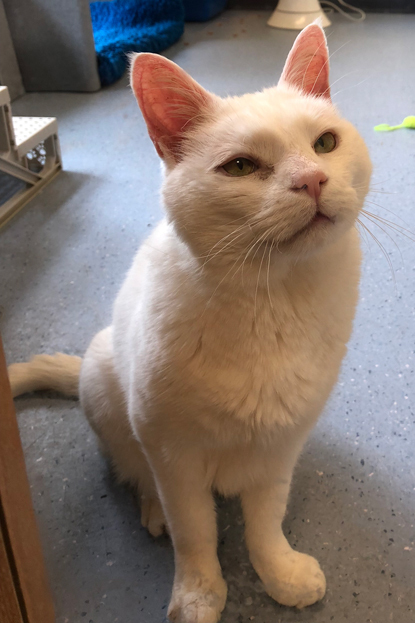 Ten-year-old Zeus is on prescription food to prevent urinary tract discomfort, so needs an owner who can invest time and patience in caring for him. He arrived at our Wrexham Adoption Centre over three months ago after getting stressed by the arrival of a new baby in his previous home, so would need to live with no other children or pets. If you can offer Zeus a home, email wrexham@cats.org.uk or call 01978 313 574. 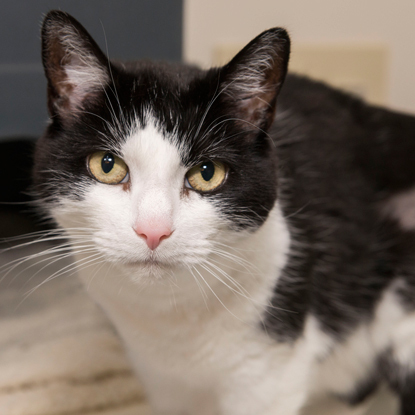 Gloria is five years old and can be a nervous girl who needs time to build a bond. She can be quite affectionate, but she's also independent and likes things to be done on her own terms. She was given up because her previous owner was severely allergic and has been at our Wrexham Adoption Centre for over three months. She would suit a mature household where she can be the only cat in the house but, with a slow introduction, could live with a calm dog. She also needs a home with outdoor access as she likes to spend time outside. 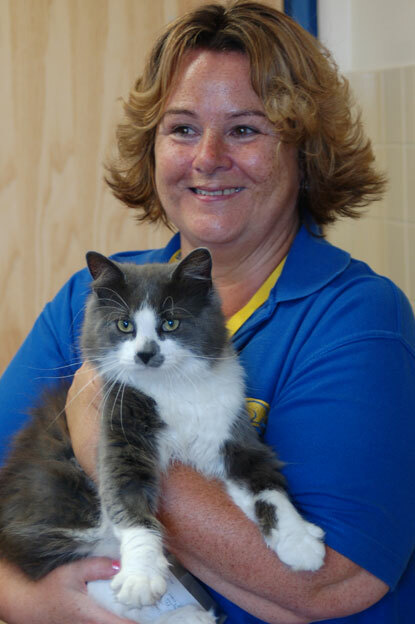 If you can offer Gloria a home, email wrexham@cats.org.uk or call 01978 313 574. Chuckles has a congenital narrowing of her windpipe, which doesn’t affect her too much but causes her to have a bit of a wheeze if she gets stressed. She also makes a ‘chuck’ sound when she eats, which is how her previous owner came to name her Chuckles. She is 10 years old and has been at our Tyneside Adoption Centre for over three months, where she is waiting for a quiet home to relax in. If you can offer Chuckles a home, email tyneside@cats.org.uk or call 01916 531 052. Eight-year-old Lily was found as a stray and has been at our Tyneside Adoption Centre for over two months. She has a very sweet temperament and loves everyone she meets so would make a wonderful addition to your home. If you can offer Lily a home, email tyneside@cats.org.uk or call 01916 531 052. Can't find your purrfect partner here? Visit www.cats.org.uk/adopt-a-cat to find more cats available for adoption in your area. Catch up on our Kitten Academy series to see how much Apple and Apricot have grown. Once they turned eight weeks old, Apple and Apricot were finally ready for rehoming and unsurprisingly it didn’t take them long to get adopted. 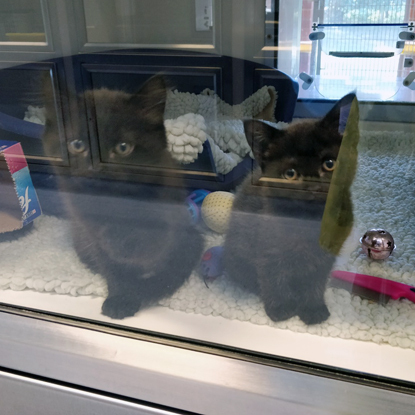 The cute sisters were reserved straight away and can now look forward to having their own space to explore in their new forever homes. 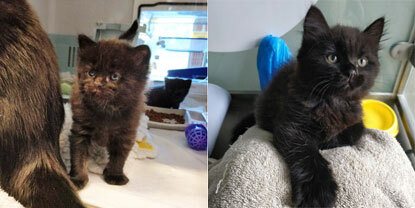 Before they went, both kittens had a trip to the vets for a full health check and were found to be happy and healthy. They were vaccinated to protect them against common feline diseases, microchipped so their new owners can register them and be reunited with them more easily if they go missing, and neutered so that they don’t have to suffer the ordeal of having kittens themselves. They bounced back very quickly from their operation, running around their pen and chasing their toys like normal the next day. Apple is wonderfully fluffy and playful and loves to run, pounce and jump on anything that moves. She is still the bigger kitten, both in size and personality, but Apricot has also come into her own and has become quite skilled in stealing the toys from her sister when she’s not looking. She is now almost unrecognisable from the tiny bundle of grey fur she once was, having grown into a beautiful black kitty. In other equally fantastic news, mum Annie has also found her forever home. She is such an affectionate cat so will no doubt love getting fuss from her new owner, including her favourite – head rubs. She has also now been neutered so can relax without the worry of having another litter. She definitely deserves a rest after doing such a good job with Apple and Apricot. We hope to be able to update you on Annie, Apple and Apricot’s adventures in their new homes in the future but in the meantime you can catch up on how they got on at Kitten Academy here. Reuniting cat owners with their moggies is an important part of Cats Protection’s work, but sadly it’s not always an easy task. Many cats that wander away from home seek shelter in cosy sheds, garages and outbuildings, only to be accidentally locked in by unsuspecting property owners. Linda Potham-Reynolds, a fosterer for our Teignbridge & Torbay Branch, knows all too well the stress this can cause. On Mothering Sunday in 2017, her tabby cat Whiskers went missing from her home. Seven days later, the neighbour had gone back into the garage to move the furniture and Whiskers had run out. He then noticed the collar on the floor and, realising how long she must have been trapped for, decided to visit her owners to check she was ok. Sadly, stories like Whiskers' are all too common, and not all of them have such a happy ending. 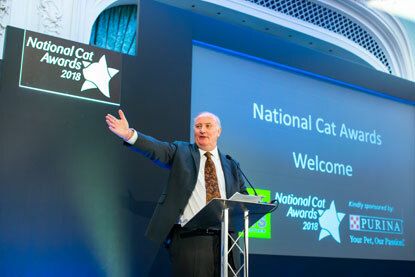 Cats Protection received almost 2,000 calls about missing cats to its National Information Line over the last year, with the highest numbers reported in the last two months. And these figures are just the tip of the iceberg as many more cats are reported missing via social media and directly to each of the charity’s 250 branches and 36 centres across the UK. 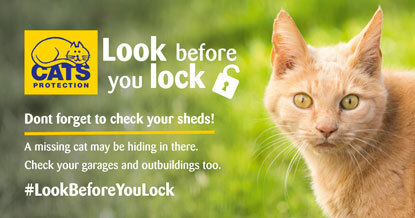 To help prevent other cats like Whiskers from suffering, Cats Protection has launched the #LookBeforeYouLock campaign to encourage people to check their sheds, garages and other outbuildings regularly for missing cats. We’ve even created a handy door hanger that you can put on your shed or garage door to remind you to look carefully before you lock up. Download it from www.cats.org.uk/check-your-shed where you’ll also find lots of advice for what to do if you’ve lost or found a cat. 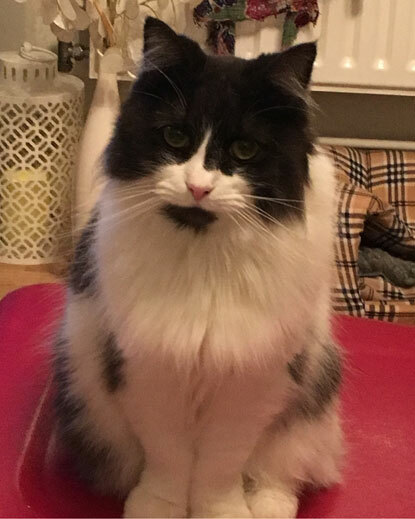 When Molly Rayment’s cat Wispa went missing from her home in St Albans, she quickly feared the worst. It was very unlike the black-and-white moggy to be gone for more than a few hours, so when Molly woke at 3am on 8 May to find her cat wasn’t home, she knew that something was wrong. 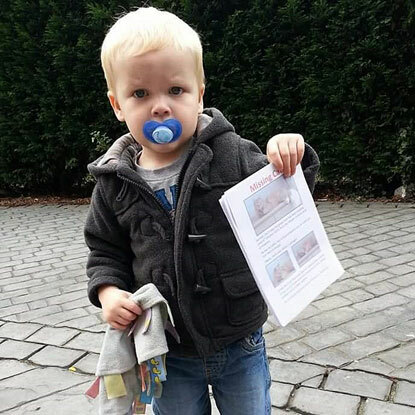 After a thorough search of the house and surrounding streets, Molly then went knocking on the neighbours’ doors and handing out over 200 posters, asking people to check their sheds and garages in case her cat was shut inside. 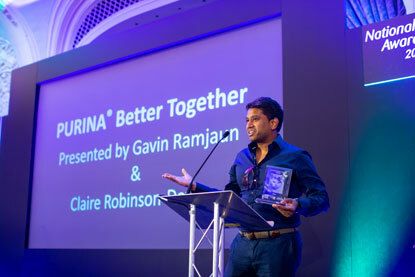 When none of her neighbours came back with any news, Molly then began putting up posters on lampposts and bus stops, posting about Wispa on social media, and contacting local forums and charities, including Cats Protection’s St Albans Branch. Knowing that Wispa was microchipped, she also notified the microchip company and made sure her details were up to date. “I couldn’t have done any more to find her,” explained Molly. “I didn't sleep because I didn’t want to miss her if she did come home and I also went to places at night where people had said she may have been seen so I could call for her when it was quieter. Then on 27 May, 20 days after she had last seen Wispa, Molly got a call from one of her neighbours. They had found a cat in their garage and thought it was her missing moggy. A trip to the vets revealed that Wispa weighed just 1.9kg, 2kg less than her normal healthy weight. 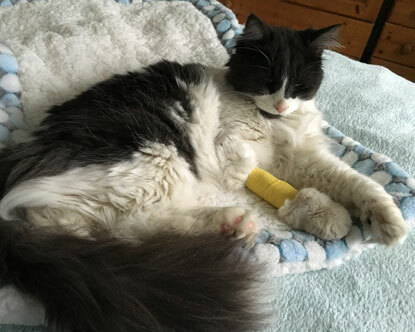 She was put on a drip for the next three days and then over the following three weeks, Molly had to be careful to only feed her small amounts every few hours. Molly is now keen to urge the public to be extra vigilant if they know a cat is missing in their area. “The garage owner felt awful,” said Molly. “She said she had looked after I first mentioned Wispa was missing and had opened the shed once a week since to get the lawn mower out. But she would have been too scared of the mower to come out! Sadly, stories like Wispa’s are all too common, and not all of them have such a happy ending. 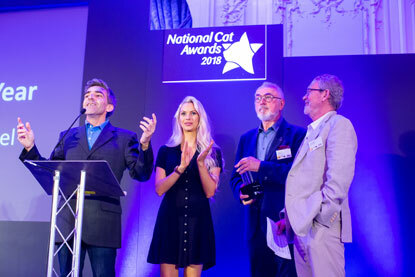 Cats Protection received almost 2,000 calls about missing cats to its National Information Line over the last year, with the highest numbers reported in the last two months. And these figures are just the tip of the iceberg as many more cats are reported missing via social media and directly to each of the charity’s 250 branches and 36 centres across the UK. 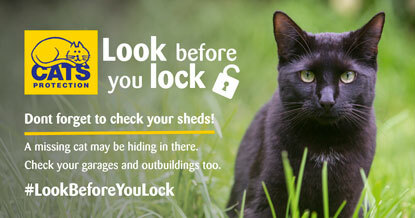 To help prevent other cats like Wispa from suffering, Cats Protection has launched the #LookBeforeYouLock campaign to encourage people to check their sheds, garages and other outbuildings regularly for missing cats. 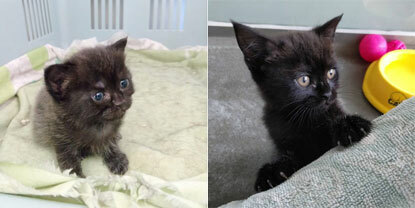 Kittens Apple and Apricot are now seven weeks old and ready to graduate from the kitten socialisation programme. It’s amazing to see how far they have come, from sleepy little bundles of fur to fuzzy cats full of character and energy. Apple is still the bigger, more confident kitten, but Apricot is gradually catching up with her sister as she’s now much more playful and able to get her fair share of time with the toys. The plastic straw is still their favourite plaything. Apple loves to hide underneath the ramp in the pen and then suddenly jump out to pounce on the straw (as you can see in the first video below) – giving you a bit of a shock if you don’t know she’s under there! Apricot likes to chase the straw around, getting lots of exercise as she follows it up and down the ramp again and again (watch her demonstrate in the second video below). All of the new experiences the kittens have encountered over the past five weeks have really helped them to grow in confidence, as they are no longer fazed when a human approaches their pen. They still need a bit of encouragement to come forward for a fuss, but rattling a ball or dragging a straw along the floor usually does the trick. After listening to the radio and a CD of household sounds, they’re also not bothered by a bit of background noise, and don’t even seem to notice when some of their kitten neighbours make a noise in the pens next door. They also happily bound around on a variety of different floor surfaces and are used to a range of different food flavours and litter types, hopefully meaning they won’t be too fussy in their forever home. Once they turn eight weeks old, Apple and Apricot will go to the vets for a check-up and the handling they’ve had should mean that they won’t be too stressed when being examined, vaccinated and microchipped. They will then have a very important operation – neutering! This will protect them from a number of diseases and means they won’t have to go through the ordeal of having kittens themselves. Mum Annie will also be neutered, so she doesn’t have to worry about having another litter, and then all three will be ready for adoption. Saying goodbye is always emotional for our kitten socialisers, but seeing all that hard work pay off and knowing they have set the kittens up for a happy future in their forever homes is a wonderful feeling. Plus, it won’t be long before another litter arrives and enrols in Kitten Academy – the work never stops! That’s all for our Kitten Academy series, but we will update you when Apple, Apricot and Annie finally find their forever homes! If you would like to volunteer for Cats Protection, you can find the opportunities available in your area here. 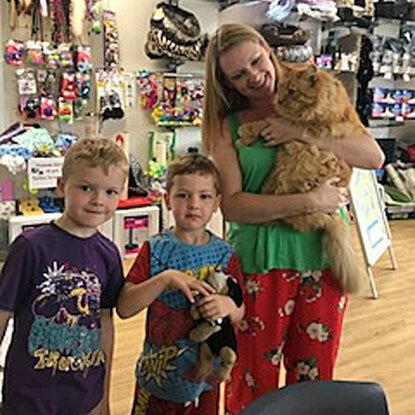 A family from Derby has been reunited with their long-lost ginger cat after five years of heartbreak. Samson went missing in October 2013 but Hannah Guy never gave up hope of finding him again. 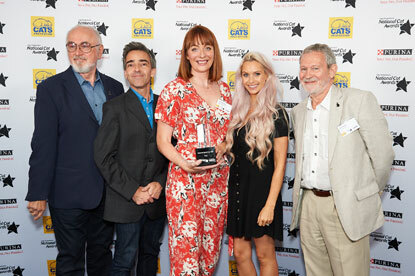 Finally, her faith was restored in July 2018 when she received a call from Cats Protection’s Derby Adoption Centre saying Samson had been handed in. 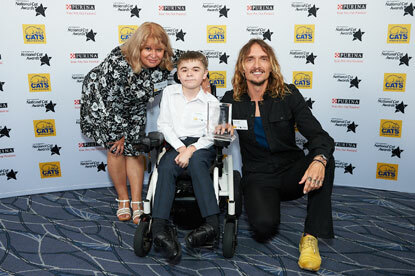 “I was so surprised and overwhelmed that it took a while for it to sink in,” said Hannah. 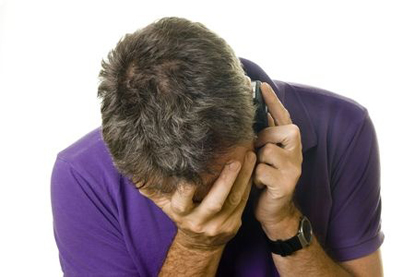 “When we moved house in June 2013 one of the first things we did was to update Samson’s chip details, we even did this when our mobile numbers changed. I’m so glad we did otherwise we never would have been reunited. 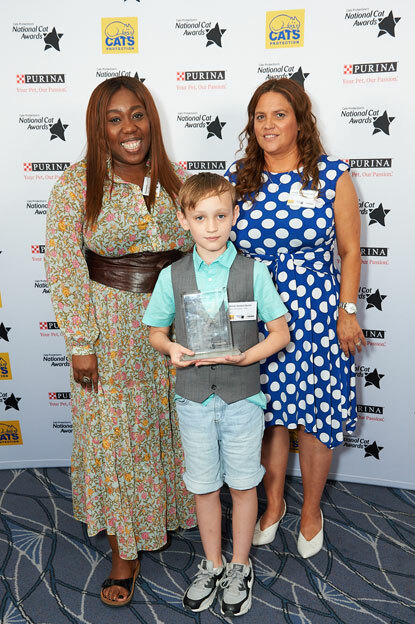 “We tried everything to find him, from registering him as ‘missing’ with the microchip database, making and delivering 200 leaflets and, nearly five years on, driving past our old house on the off-chance he made his way back there." The whole family is relieved to have Samson back, especially Hannah’s two boys; Oliver, seven, and five-year-old Elliot. In Samson’s absence, Hannah adopted another rescue cat called Bo in 2017 who fortunately welcomed Samson home like a long-lost friend. 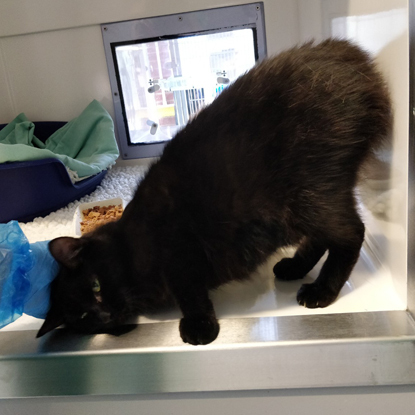 Natasha Wood, Deputy Manager at Cats Protection’s Derby Adoption Centre, said: “Samson was handed into our centre and, as standard procedure, scanned for a microchip. To our excitement, Hannah’s details popped up and we were able to call her with the amazing news that we had Samson. It was a very emotional phone call and we both had to take a minute to calm down. “Hannah and her two boys then rushed to our centre and it was a pleasure to see them being reunited after so long.